You can, of course, buy rail tickets at station ticket desks. You can also buy them from the conductor on the train, although you’ll be charged an extra 30 crowns for the privilege unless you can prove there was no ticket desk open/available at the station where you got on. Alternatively, you can book by telephone by calling 840 112 113 in the Czech Republic. You’ll be asked for your credit card details and the ticket will be sent to your e-mail address. For all the above options, however, communicating in English may well be a problem. The fourth option is to buy online at the Czech Railways eShop. The big disadvantage for cyclists is that the booking system is not enabled for bike reservations on most trains. I contacted Czech Railways about this and received a curt reply saying that it is not possible to reserve or purchase a place for a bike via their eShop. This is not entirely true, as I know for a fact that you can book your bike onto SuperCity (SC) Pendolino services in this way. I’ve done it and encountered no problems. Pendolinos run on two routes: Prague-Ostrava-Třinec and Prague-Brno-Vienna; each train has room for just three bicycles. For all other trains, I’m afraid you’ll have to use one of the other options described in the previous paragraph. So, here’s my step-by-step guide to buying a railway ticket in the Czech Republic. 1. Go to the Czech railway timetable (click on “English” in the bottom right-hand corner if necessary). Enter your travel requirements and click on “Search”. 2. A list of itineraries will appear. Trains for which tickets can be bought on-line have a yellow shopping-trolley icon next to them (see below). Choose the train you want and click on that icon. You will be taken to the Czech Railways eShop (the instructions should be in English; if not, click on the Union Jack flag in the top right-hand corner). 3. Select the number and type of tickets you want. If you want to reserve a seat, check “yes” against “Reservation”. A new box will appear below. You can then choose from various seating options. 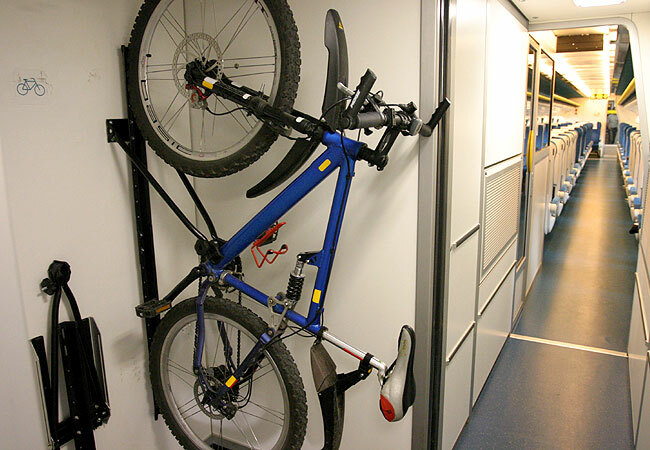 (If you’ve chosen a Pendolino train and you want to book your bike on it, select the “seat and bike” option.) Then click on “Show ticket” in the bottom right-hand corner. 4. If your request is successfully accepted, the journey details and ticket price will appear. Press “Add to shopping cart” and the content of your cart will be shown. 5. Now you need to register in order to pay. Click on “Registration” at the top of the screen and enter the requested details. You will then receive an account activation code by e-mail. Follow the instructions to activate your account. 6. Now go back to your shopping cart and click on “To the cash desk”. Enter your details (name and passport number) and click on “Pay”. 7. Go through the payment process. When this is completed, you will be able to print out your ticket. A copy will be sent to your e-mail address. Bon voyage, or šťastnou cestu, as the Czechs say! I am traveling from Prague to Cesky Budjovice by train in June of this year. Booking the tickets from the UK don't seem a problem; reserving the bicycle does. How advisable is it to book a bicycle the day before my train journey? Do the have a limit on unaccompanied luggage? Do they become quickly subscribed? I arrive in Prague on a Sunday and will be traveling early the next day. Can I book it from the main train station in Prague? Great blog by the way, lots of useful advice. Thanks for your query and your kind comments. I'd say they're very unlikely to be fully subscribed on a Monday morning in June, but I certainly recommend booking the day before. In fact, reservation is compulsory for most of those Budejovice trains, and you have to book more than two hours in advance. Unfortunately you can't reserve online. You can use the booking office at the main railway station. I've checked the Czech Railways website and they don't mention any limit on unaccompanied luggage. HTH. Feel free to get in touch again if you need any more info. W e are looking to take the noon train to Berlin in a few weeks and already bought Eurorail passes being from the US. In the schedule I see a note that to please reserve. Seems my only choice is to call and hope I get an English speaking agent, as I see no way to reserve online having Eurorail passes. Am I mistaken? AFAIK there is no way to reserve on-line. You will certainly need to reserve, and in my experience the sooner the better, as it's a popular route. I would start by contacting German Railways (DB Bahn) on +49 1805 996633, as they are better organised than the Czechs. I've made various reservations (in English) that way. If that fails, e-mail me via my Blogger profile (under "About me" at the top left of this page) and I'll see what I can do to help.